Sussex leg-spinner Will Beer has signed a new two-year contract, which will keep him at the club until the end of the 2017 season. The 27-year-old was a regular in limited-overs cricket in the summer, and also appeared for Oxfordshire in the Minor Counties Championship. "To be given another two-year contract by the club I've grown up playing for is fantastic for me," he said. "With new signings and a new captain I think the club is moving forwards." 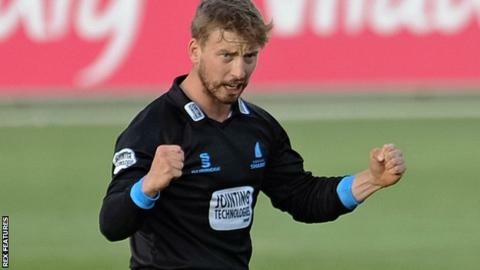 Beer featured 14 times for Sussex in the T20 Blast, taking 11 wickets with an economy rate of 7.29 runs an over. He took a further two wickets in six appearances in the One-Day Cup. "Will has become an integral member of our one-day team, and should prove to be one half of an exciting partnership with (signing) Danny Briggs," Sussex cricket manager Mark Robinson said. "He is one of our best fielders and scores valuable runs."